NORTH VANCOUVER, BC – A new brewery with a slightly confusing name is now open in the Lower Lonsdale area of North Vancouver. 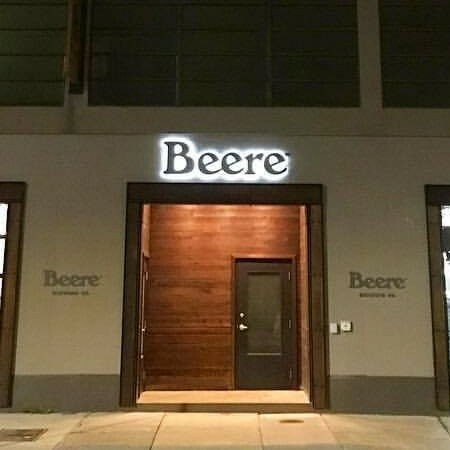 Beere Brewing has been founded by Matt Beere and his father Craig Beere, which explains the extra “e” in the brewery name. Located in a space that was previously used as a warehouse for the elder Beere’s timber company, the brewery and taproom officially opened on October 20th, and is offering a variety of beers from the brewing team of Matt, Nick Murphy, and Kevin Elliott, including Go Easy Pale Ale (5.5% abv), Mental Floss IPA (7.9% abv), Cold Brew Coffee Stout (5.3% abv), and Pushing Daylight Saison (6.9% abv). Beere Brewing is located at 312 Esplanade E. in North Vancouver. For more details, see the brewery website and Facebook page, and the recent profile article at North Shore News.